The autumn USA Greco-Roman tour of Sweden is on its last legs and the only we know for sure right now is that the endgame will likely include a whole bunch of medalists. Day 1 of the 2018 Malar Cupen began this morning in Västerås, Sweden with over 40 American athletes in attendance. That’s because one delegation, led by Northern Michigan head coach Rob Hermann and which includes a group mainly consisting of NMU wrestlers, linked up with an age-group tour headed by Wisconsin’s Jared Lewis, father of 2018 Cadet World Team member Hunter Lewis (65 kg). 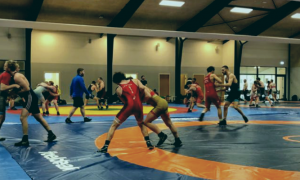 The result is nearly four dozen American Greco-Roman athletes between Schoolboy and Senior all overseas at the same tournament, bringing back fond memories of that record-breaking week in Europe this past spring (full results from the Schoolboy division will be included in tomorrow’s Day 2 recap). Speaking of the younger Lewis, he is 3-1 thus far at the 2018 Malar Cupen with all three victories coming by way of tech. His lone blemish, a 3-2 decision loss to Alexander Riefling (GER), does not spit Lewis into a repechage; due to the Nordic system format, all Lewis has to do is win out and he’s assured of a medal. Fellow 2018 Cadet World Teamer Dominic Damon (67 kg, WA) is competing in the Senior division of the tournament and is 2-0 with a tech and a pin. Earlier this week, Damon was victorious in the USA/Team Skåne Brottning dual meet, as well. There are other 3-1 records to account for after Day 1, starting with Logan Hatch (65 kg, WI). This is Hatch’s third trip to Sweden and the high schooler is back at full capacity following a season lost to injury. On Saturday, Hatch grinded out a criteria win over Sweden’s Samuel Trellid, knocked out a tech and a fall to win his next two matches, and then fell to Noel Fredlund (SWE) 9-2. It’s a similar story for Oregonian Noah Wachsmuth (65 kg), who is also 3-1. Wachsmuth dropped his second bout of the day to Kasperi Kauhanen (FIN), but look at the box scores: in his three wins, Wachsmuth outscored the opposition 27-0 with three tech’s. Cole Stephenson (60 kg, CO) lost his first match to Victor Borgström (SWE) via fall; in the proceeding three bouts, Stephenson got on a tear to drum up back-to-back-to-back superiors. Sean Sesnan (60 kg) will look to to bring a second-straight overseas medal back to the Williams Baptist wrestling room. Sesnan is 2-0 heading into Sunday. If you count the Bill Farrell Memorial this past March, this could be a hat trick for Sesnan — he was silver in New York, silver at Klippan, and is in position this weekend for hardware again. These are the only three international events Sesnan has ever competed in. 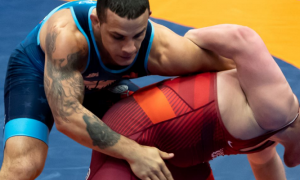 Corey Fitzgerald (82 kg) and young Tyler Curd (130 kg) have also survived Day 1 of the 2018 Malar Cupen unscathed. For Fitzgerald, one of Marquette’s hardest workers, a podium spot at this event could hopefully lead to a gain in momentum as the season begins to progress. 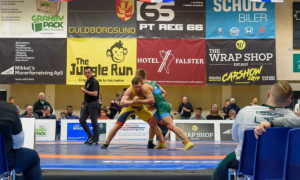 Two-time Cadet World Team coach Lucas Steldt, who is coaching on this tour yet again, had this to say once wrestling wrapped for the day in Västerås. Day 2 of the Malar Cupen begins tomorrow morning at 10:00am (4:00 EST). *Schoolboy results will be released following Day 2. I’ll be sure to not miss these competitions.